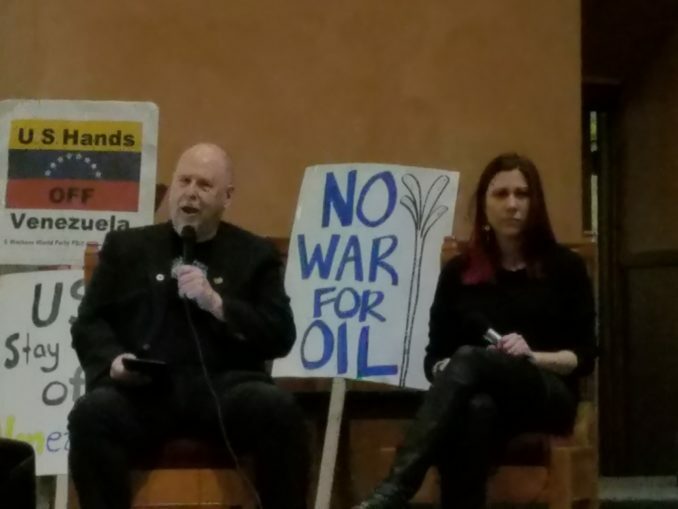 The March 30 reportback organized by Portland’s Hands Off Venezuela PDX group featured Dan Shea, a member of Portland’s Veterans For Peace. Shea was one of a dozen anti-war leaders who traveled to Venezuela as part of a solidarity delegation sponsored by the U.S. Peace Council. Candy Herrera, a worker for an education union and a member of Hands Off Venezuela PDX, was the chair and emcee for the meeting. Shea said the delegation arrived in Venezuela during a power outage, an act of sabotage caused by electrical hackers working with the U.S.-backed opposition. He said that half the country suffered from no electricity for more than a week. Elevators in apartment buildings had stopped, putting elderly and disabled people especially at risk. 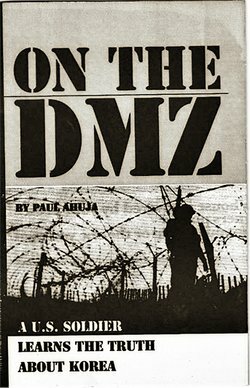 Shea was exposed in Vietnam to Agent Orange, the deadly herbicide and defoliant sprayed across the jungles by the U.S. military. Afterwards, his son Casey was born with congenital heart disease and a cleft palate, and was given to seizures. Casey went into a coma after 10-hour heart surgery that eventually caused his death. Shea said that his story is just one of millions. During the Vietnam War, 4 million Vietnamese people and 2.8 million U.S. troops were exposed to dioxin, the carcinogenic ingredient in Agent Orange. It has had a deadly impact on generations of Vietnamese people and the GIs who served in Vietnam. More than 50 years later, lives are still being lost due to horrific health issues and chemically induced genetic mutations. Just as the delegation was preparing to leave Venezuela, American Airlines suspended flights to Venezuela. The pilots’ union said “conditions were too dangerous” in the country. During their five-day delay, Maduro arranged for a public meeting with the delegation. At the meeting, Shea presented Maduro with a gift: his Veterans For Peace dog tag which reads, “Dedicated to ending war.” Maduro immediately put the tag on and announced the gift publicly and online in tweets. Shea’s final message was that people have to organize, organize, organize to end the sanctions, sabotage, lies and propaganda issued by the U.S. against Venezuela.